Drainage Maintenance and Emergency Services from Tampa to Venice, Florida. Call Jeff Earl 941-201-2672 for a Emergency Service. Foundation Masters, LLC is a Full Service Commercial, Industrial and Residential Drainage Expert in Tampa Bay, Florida. We specialize in Parking Lot Drainage Systems for New Parking Lot Construction and Parking Lot Drainage Problems and Repairs. Foundation Masters, LLC is a Civil Engineering Company and what this means is we can help you with a simple problem with your parking lot catch basin, stormwater drain or water basin Drainage Flooding that needs to be fixed quickly or we can design and/or replace your entire Parking Lot Drainage System. We have years of experience in design and/or repairing and replacing parking lot catch basins and storm drains for companies and businesses, and we would be happy to give you a free estimate on just what it will take to solve your Parking Lot Drainage Problems. 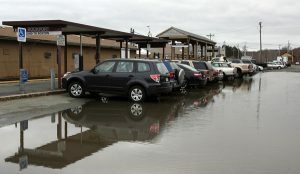 We specialize in servicing parking lot catch basins and Storm Water Drains and our top-of-the-line equipment and experienced technicians can solve any Parking Lot Drainage Problems. Whether it’s parking lot excavating, high pressure water jetting to eliminate clogs and stop flooding from rain, we can help. Foundation Masters, LLC services Tampa, Sarasota, Bradenton and Venice, Florida and all surrounding areas.